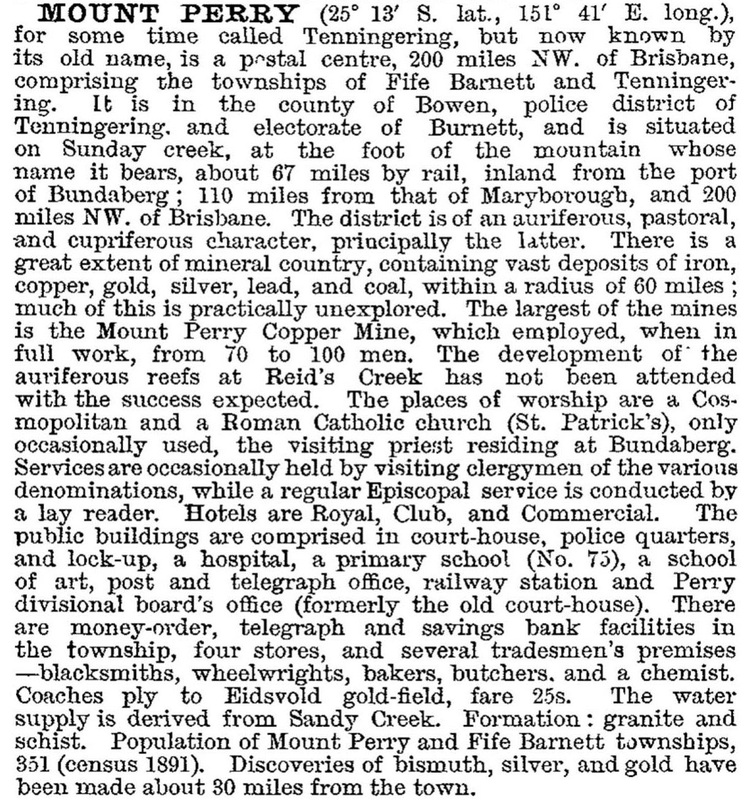 Mount Perry, formerly a copper mining and smelting town, is 80 km south-west of Bundaberg. The mountain is the southern-most peak in the Hogback Range, five km east of the town. The mountain was probably observed by the colonial surveyor, James Burnett, in 1847 and named after the Deputy Surveyor-General, Samuel Perry. In 1851 the Mount Perry pastoral run was taken up by its first proprietor, Robert Wilkins. In 1862, Henry Dingle (described as squatting in the neighbourhood) reputedly noted evidence of copper ore. 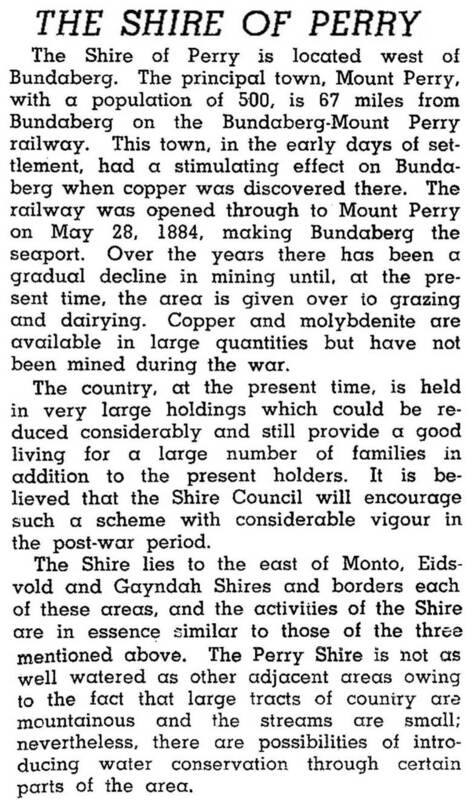 In 1869 Dingle came upon evidence of rich ore and with a better understanding of the profit from minerals (Clermont, Cloncurry and Peak Downs copper had been discovered a few years before), precipitated a rush of prospectors. Within a year a Sydney entrepreneur, Ebenezer Vickery, invested in six shafts and four tunnels, and by the end of 1871 had taken out 1500 tons of ore. Several other companies and individual prospectors worked their own mines. Among the holders of mineral selections were the partnership of G.R. Fife, A. Heusmann and J.W. Barnett who, taking advantage of the fast growth of population, subdivided their holding for building sites. It evolved as the town of Fife-Barnett. By mid-1871 it was reported that there were five hotels erected or in the course of being built, a blacksmith and several stores. A newspaper, the Mount Perry Mail, began publication in 1872. The smelters closed in 1915, and Mount Perry adjusted to becoming a pastoral town. The railway connection ended in 1960 and the court house was converted to a public hall the following year. The hospital had been without a resident doctor since the mid-1940s and was designated a cottage hospital in the 1970s.